This is the story of a superstar and his sport, though whether what he did for a living is a sport has been debated since the . . . activity . . . was invented. The fact that I spent quite a few evenings engaged in it when I was a young man makes it all the more unlikely that it requires enough athletic prowess to make it a sport. 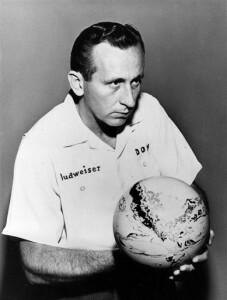 The superstar, whom I’ll introduce in a little while, was a professional bowler. Settle down, you cricketers. We’re talking indoor bowling, the kind where participants roll a heavy — and I mean heavy: often 7-kilo (15½-pound) — plastic or resin ball. 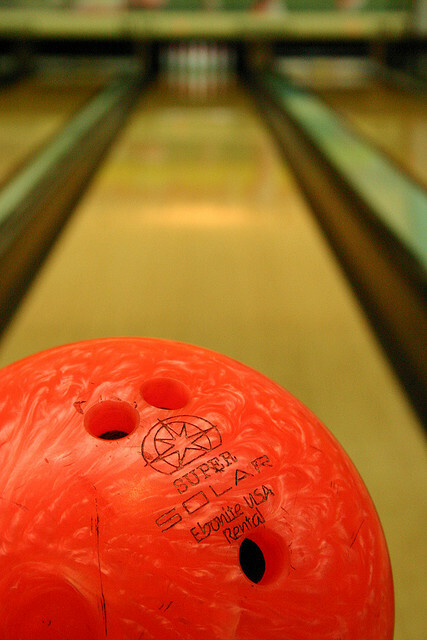 At first, when bowling balls were lighter, they were made of wood, then rubber. Bowlers stick three fingers into the holes that have been drilled in the ball, hoist it upward and cradle it in their dominant hand, and shuffle forward on a slippery floor in soft bowling shoes or their stocking feet. Come on, what athlete competes in his Slipper Socks? Then they swing the arm that holds the ball backward while bending their knees, slide forward to a release line on the floor, and fling the ball down a long wooden row called a “lane,” 18.3 meters (60 feet) long. 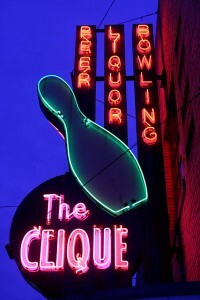 It’s a lane, but the building that holds a bunch of them is called an “alley.” A bowling alley. Go figure. 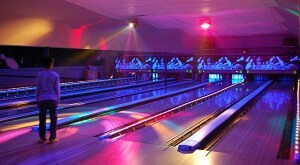 Running along the sides of the lane are recessed “gutters” into which your ball is sure to wobble as you’re learning the game. You get no points when it does, and it serves you right. They’re funny-looking: chubby at the bottom, tucked in in the middle, and bulbous at the top — a little like those Russian nesting dolls, but less colorful. What are thought to be among earth’s first bowling pins were discovered in a boy’s tomb in ancient Egypt. Lawn bowling, in which balls crack into each other rather than pins, and an indoor game with one or more heavy balls and nine small “skittle” pins were huge across the British Empire. And Australians borrowed the old German game of Kegel, rolling a ball at nine pins. How many times can you write “bowler,” after all? The object of tenpin bowling sounds quite simple: propel the ball in such a way that it smashes into the 10 pins and knocks every one of them down. If you do, it’s called a strike. Strikes are good in bowling and fishing, bad in baseball and labor negotiations. If by some miracle you do this 12 straight times — in the 10 “frames” or turns that you get in each game — you’ve bowled a “perfect game,” for which you earn 300 points. (It’s 12 in 10 because you must bowl three in the 10th frame to qualify for the perfect game.) You are then, according to custom, permitted to jump in the air, shriek like you’ve won the lottery, pump your fists, and accept high-fives from friends and nearby strangers. This can be even more bedeviling than felling all 10 pins. Especially when one, the 7 pin, looms all the way over to the left, and another, the 10 pin, stands — and would be thumbing its nose at you if it had a nose — all the way to the right. The dreaded, gaping 7-10 split confronts you. • or roll the ball deftly and delicately toward the outside edge of one pin, gently nudging it inward so that it slides over to the other side and knocks the second pin down. Most of the time when you try this, your ball thunks into the gutter. Or, as happened in my bowling “career” after school and in an evening league or two, your ball will roll harmlessly down the middle, missing both pins by a wide margin. Whatever is the opposite of jumping up and down, high-fiving, and drinking free beers is what you do in this case. Some Americans take bowling VERY seriously. They get duded up in a bowling shirt with their names and the team name — “The Bowling Stones,” “PinHeads,” “High Rollers,” clever stuff like that — stitched on the pocket. They choose a ball with the care that a bridegroom uses to pick a wedding ring, then engrave it with their own, ever-so-witty names: Jim “Strike Force” Palooka; Barby “Bowlicious” Bowinkle; Karl “King Pin” Kowalski. 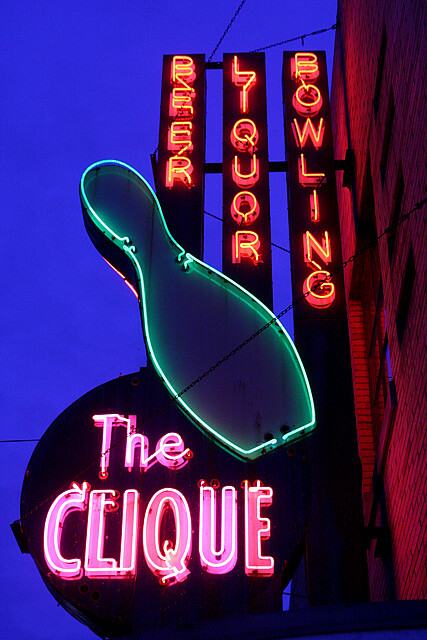 They polish their bowling balls, carry them in cases fit for an art treasure, file their fingernails before bowling, then wave their cuticles in front of the little blower that’s attached to the ball rack lest a drop of perspiration interfere with the ball’s release. 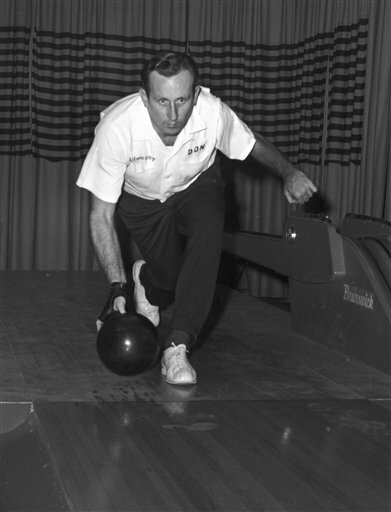 Then, with a contortionist’s twist of the wrist and a carefully calculated knee-buckle and hip-wiggle, they waddle toward the line, then glide — not heave or throw but glide — the ball down the lane toward a predetermined spot precisely between the One and Three pins (the One and Two if they’re left-handed). It’s a danze la bowl that would make a trigonometrist giddy. If there were such a thing as a trigonometrist. Bowling nerds study various grips, “rev rates” (ball rotations), and the drag effect of the finger holes on a rolling, spinning ball. They watch professional bowling on television, though it’s harder to find than it was when bowling filled a lot of hours in TV’s black-and-white era of the 1940s and ’50s. They watch their kids bowl on the high-school team. There, and on the men’s and women’s pro circuits, bowling is definitely considered a sport. It is not, however, an Olympic one, which prompts bowlers to write to sports blogs and demand to know why, then, curling — in which mostly Scandinavian and Canadian people gently nudge a polished stone forward across a sheet of ice while others run alongside, sweeping frantically with brooms — is in the Olympics. Beers. Three or four of them — and a plate of nachos with melted cheese — consumed right at your seat near the ball rack. When’s the last time you saw a beer cart beside a World Cup bench or a Super Bowl huddle? 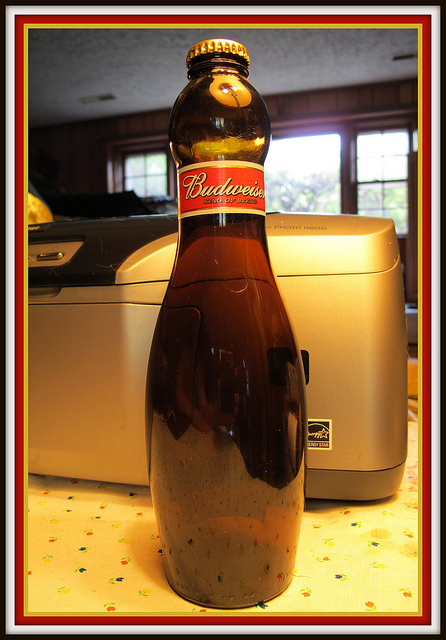 In fact, I believe “beer belly” is found in the official glossary of bowling terms. 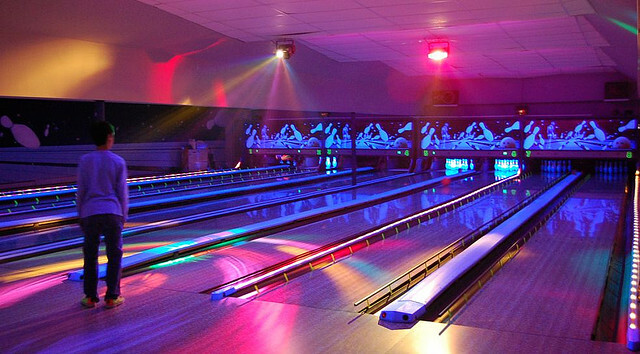 So bowling is “recreation” for most of us, but it’s the jewel of competition in another way: I’m convinced that bowling survived and grew because it was a fun, public, inexpensive activity that pubescent boys and girls could enjoy together without getting in trouble — in every sense of that word. Which brings us to that superstar, who died about a week ago at age 85. I would guess he had one of those first dates at the lanes. 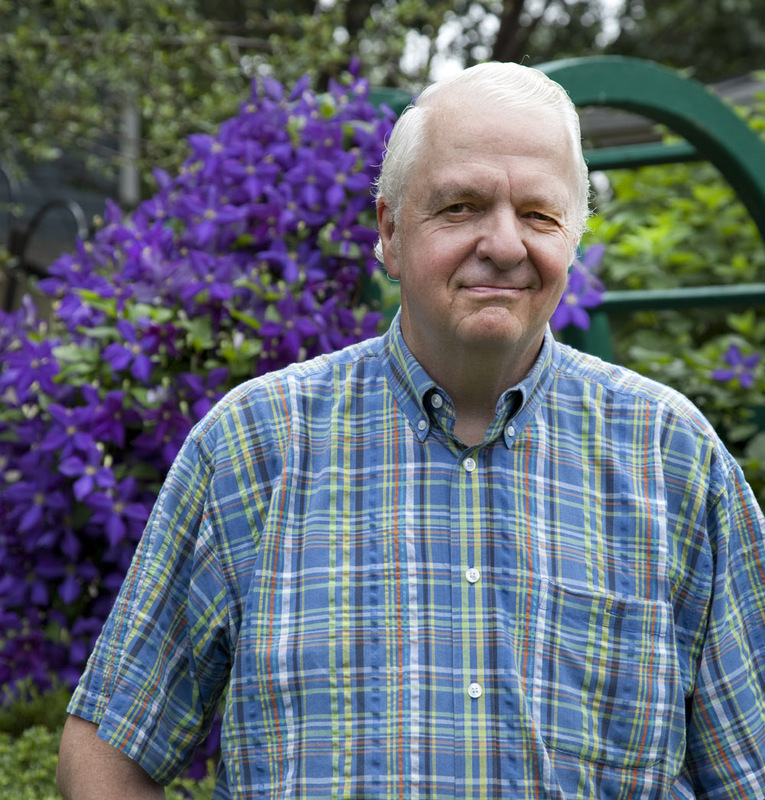 His name was Don Carter. Not Don “Crusher” Carter or Don “Crazylegs” Carter or “Dandy Don” Carter. Carter rolled 13 perfect 300-score games — and six 299s — in sanctioned, fiercely competed professional tournaments, plus probably hundreds more while messing around with friends or practicing on the makeshift lane he built in his basement as a young man, trying to break into the game. Don Carter looked like the guy in the next office cubicle and even less ferocious on the lanes, stooping his shoulders, cocking his arm back toward his stomach rather than jerking it into a backswing, then gnarling his hand forward and down to release the ball in a motion that millions of hack bowlers tried to emulate. Some came pretty close to matching his moves, as I did, only to (a) drop the ball on their feet, (b) direct it to an adjacent alley rather than their own, or (c) release it so delicately that it stopped dead before reaching the pins. Before you bowlers write in to remind me that an object in motion tends to stay in motion (Newton, Isaac), and that a ball simply could not roll to a halt on a slippery lane, I will tell you that I have seen such with my own eyes. Admittedly, it was a cheap rental ball about as spherical as a cantaloupe, released by an 8-year-old at his birthday outing. Don Carter was in fact an athlete in the traditional, sinewy sense of the word. He was a star baseball player in high school and, between battles in the Pacific, in the U.S. Navy during World War II. Then he played minor-league ball before throwing his lot in with keglers. He was in superb shape there, too, compared to a lot of his husky, cigarette-puffing opponents, having jumped around like a monkey, resetting heavy tenpins by hand at alleys in St. Louis so he could bowl for free at the other end of the lane. Before long, he was competing in six leagues and dominating them all. The robot comparison followed Carter, who appeared unemotional, clerk-like, cheerless and methodical. But so good, so intimidating, so quietly relentless that a bowling-ball manufacturer gave him a $1 million product-endorsement contract in the 1950s, when $1 million was a chunk of change. This was a larger such deal than any athlete had ever received. Carter’s name alone sold a ton of Ebonite bowling balls. Not bad for a fellow who grew up so poor in St. Louis, Missouri, that his only present on his 13th birthday was, coincidentally, 13 cents from his mother to pay for his first game of bowling. “That was the biggest birthday present of my life,” he later said. Beset by bad knees toward the end of that life — you try bending low tens of thousands of times while grasping a 7-kilo object in your hand and see what happens — Carter retired to Florida, where he remained famous in bowling circles. He had married and divorced a champion woman bowler, then married another all-star, who survives him. Obliterate. To utterly destroy something — completely wipe it out. Pubescent. About to reach, or having just reached, sexual maturity. Resin. A sticky, flammable substance exuded by pine and fir trees. The word is usually pronounced “REZZ-in.” But the little white bag that is placed near the pitcher’s mound in baseball, which the pitcher rubs in his hand to improve his grip, is called the “ROZZ-in” bag. 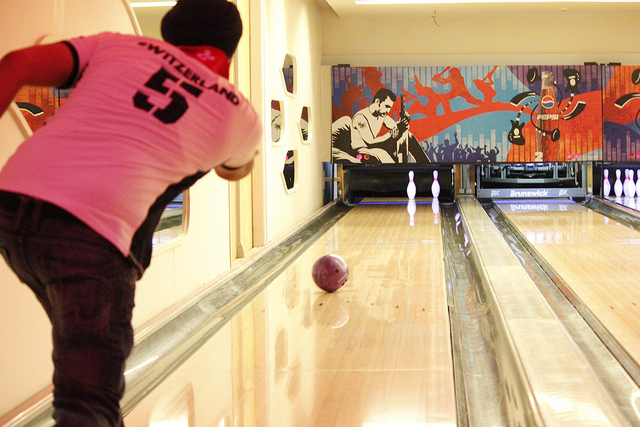 FYI: It takes 12 strikes in 10 frames to bowl a 300 game. You’re absolutely right, of course. It’s been awhile since I bowled. I’ll fix that!